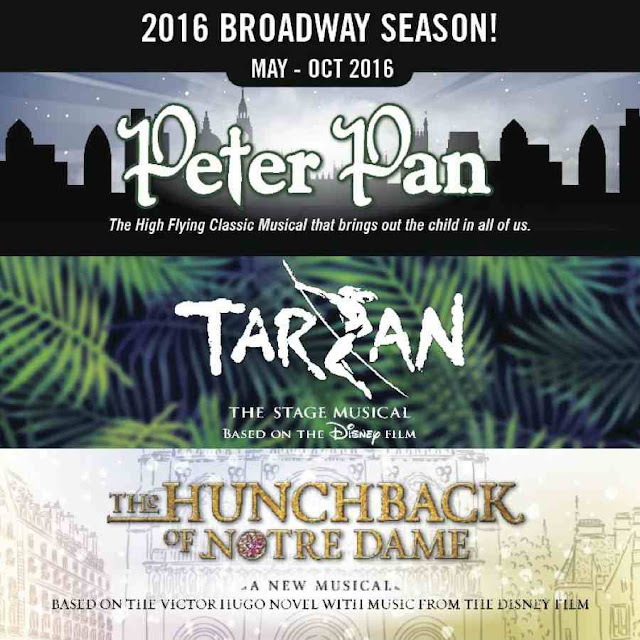 It is almost time for Tuacahn's 2016 musicals to begin!! I have been waiting for these musicals since they announced them last fall. First up is Peter Pan. Shortly after Peter Pan begins Tarzan will start. Then The Hunchback of Notre Dame will begin! They will all end in October of 2016. I think the first musical I will get tickets for is Tarzan. I know. I know. I'm a slacker and haven't gotten my tickets yet! I need to do that before they start selling out. Once the musicals start tickets seem to go quickly. Tuacahn has some amazing special effects including flooding the stage and actors and actresses flying over the audience. These are just a couple of the amazing special effects. They also have incredible props and live animals in some of their musicals! The talent is amazing. Peter Pan is the story of 3 young children, Wendy, Michael and John. Experience their adventures in Neverland with Peter Pan, Captain Hook, mermaids, indians, and pirates! Based on the story by J.M. Barrie. You remember Disney's movie Tarzan, right? This musical is based off of that adventurous animated film. Phil Collins music is upbeat and entertaining! Don't miss this story of a boy raised by gorillas. What will his future bring? Based on the novel by Victor Hugo and the Disney movie. Set in the late middle ages and tells the story of Quasimodo and Esmeralda. You can purchase your tickets online or by calling the box office at (435) 652-3300 or (800) 746-9882. Great post! Good reminder to buy tickets now. I think I will see Tarzan and Hunchback of Notre Dame. Can't wait!